Rebel Wilson was born and raised in Syndey, Australia along with her three siblings, Liberty, Ryot, and Annachi Wilson. She attended the University of New South Wales where she studied Law and Arts, earning a law degree in 2009. She also became a Rotary International Youth Ambassador for Australia and was stationed in South Africa for one year where she contracted a serious case of malaria. Rebel had hallucinations where she saw herself becoming an actress and winning an Oscar. This somewhat unlikely but true event is what pushed her to pursue an acting career. Back home in Australia, Rebel is known for her role as Toula on the SBS series Pizza and as an assortment of characters such as Lucy, Fat Mandi, and Karla Bangs on another sketch comedy series, The Wedge. She also had roles in the feature films Fat Pizza and Ghost Rider , both filmed in Australia. Rebel showed even more creativity when she created, wrote, produced and starred in the musical comedy series Bogan Pride that aired on SBS One. Moving to the United States, Rebel was signed to William Morris Endeavor. Her first film role in the States came in the Judd Apatow film Bridesmaids , where she was a standout as Brynn, the roommate of Kristen Wiig’s character. On August 2011, Borys Kit of The Hollywood Reporter reported that Rebel would become the first person cast in the new comedy Pitch Perfect (2012). For her performance as Fat Amy in the movie, she received much critical praise and from this, she received several nominations, including Best Supporting Actress from the San Diego Film Critics Society and Best Actress in a Comedy from the Broadcast Film Critics Association. 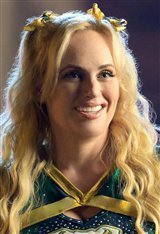 Rebel, who hosted the 2013 MTV Movie Awards, played supporting roles in the motion pictures Pain & Gain (2013)and Night at the Museum: Secret of the Tomb (2014) before reprising her role as Fat Amy in the sequel Pitch Perfect 2 (2015). More recently, the actress starred in How to Be Single (2016) alongside Dakota Johnson and Leslie Mann, The Brothers Grimsby (2016) starring Sacha Baron Cohen, as well as made a cameo appearance in the comedy Absolutely Fabulous: The Movie (2016). Her latest role is in Pitch Perfect 3 (2017).